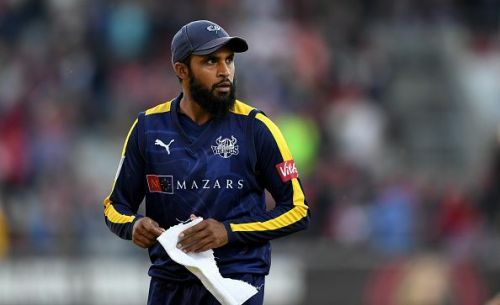 English Leg-spinner Adil Rashid, who was recently in good form against India in the limited overs, was recently recalled into the English Test squad slated to play against the same opposition in five Test matches starting August 1, 2018. Rashid has not played international red-ball cricket since his last outing in December 2016, and his comeback nearly two years later has been received with mixed skepticism. Among the many who question the selectors' move was former English captain Michael Vaughan. However, Rashid has responded to Vaughan's comments saying that Vaughan's thoughts "were nonsense". Rashid has been exceptional in recent times, especially in limited-overs cricket. He famously clean-bowled Virat Kohli in the 3rd ODI of the recently concluded series, and Virat's perplexed reaction was picked up by the media and people all over the world. In all fairness to Rashid, it's not every day that such a reaction comes out from arguably the world's best batsman right now. Rashid's outing impressed coach Trevor Bayliss, who hinted at his inclusion in the Test squad. England has been facing trouble in the spin department ever since the untimely retirement of Graeme Swann in 2013, with the side producing nearly no quality spinner since. It was believed that Rashid's inclusion can fill that gap to some extent. It is probably with that vision in mind, that Rashid was actually selected into the Test squad eventually. Rashid recently refrained himself from signing a first-class contract with his county Yorkshire, with the sole intention of concentrating on Twenty-20s and ODIs, and therefore his inclusion in the Test squad right now comes as more of a surprise. However, as mentioned earlier, Adil Rashid's inclusion into the Test squad has not been received well by many people, including some eminent specialists from the cricketing fraternity itself. Vaughan, who used to play for Yorkshire, Rashid's same county, ridiculed the decision on his Twitter account, while another former England captain Nasser Hussain also questioned the selectors' decision. So we have picked someone who cannot be arsed with 4 day cricket for the Test Team ... Forget whether he is good enough or not I find this decision ridiculous ... !!! Both of them saw it as a dangerous precedent to set for the future because they feel it will apparently open more chances for cricketers to lazily withdraw from playing actual red-ball cricket and still contest for selection in the international stage. They were also supported by Yorkshire chief Mark Arthur who expressed his due surprise in Rashid's selection. Adil Rashid himself has since replied to Vaughan's comments about his Test recall. He seemed to have the opinion that the comments made by the former England captain were "a kind of nonsense being spoken by ex-players". He expressed his feelings on the issue quite vehemently. "He (Vaughan) can say a lot and he thinks people might listen. A lot of people have got no interest in what he says. His opinions do not matter to anybody. When I mentioned at the start of the year I will not be playing red-ball cricket, he tweeted something then. He was being controversial and saying his stupid things then too," BBC Sport thus quoted Rashid's exact words. However, Rashid was quick to add that he did not think that Vaughan had much of an agenda against him, as he knew him from the times he played under him and with him on numerous occasions. He added that there will be haters in every situation and that it is not his fault. Vaughan has since responded to that as well. He is not pleased with the way Rashid has handled the situation, and has strongly expressed his displeasure on Twitter itself. Adil Rashid made his ODI and T20 debuts as early as 2009, but had to wait another six years to make a debut in whites. He did not stay for long in the format, having played just ten Tests between October 2015 and December 2016. In those ten tests, he has picked up 38 scalps at an average of 42.78. England's general aversion to spinners meant that Rashid's career did not really take off, even in other formats, playing just 73 ODIs and 32 T20Is in the past ten years. In February 2018, he signed a fresh contract with Yorkshire to play limited-overs, however he decided to stay away from the red-ball in county cricket. He has not played a first-class match since September 2017. He also feels bad for not having received congratulatory words from the representatives at his county, as they have instead chosen to be disappointed with his decision of not playing first-class for them. "I did not do anything wrong in that sense. There is no reason for Yorkshire to react like this. It was not something I expected or wanted. It would have been nice to have got the support from your county or the people close to you," he said. He is confident of performing well in the upcoming games, meanwhile. "If I give 100% and it goes well, it goes well," he spoke hopefully. It also helps that he has got the support of current players like English pacer Stuart Broad who had opined that the spinner could be of much help to the squad in the "important series", given his natural wicket-taking abilities and general performance in the international stage. The five-match Test series against India will begin with the first game on August 1st at Edgbaston, Birmingham. India are currently ranked No. 1 side in Tests. Having lost the T20I series to India and subsequently winning the ODI series against the same side, England will be keen to win the Test series as well, and prove who's the boss at their own home.